Nature and its variety of animals are everywhere, even in the city. The author follows a dog as he explores many of the scenes present in every city. A squirrel and an opossum lurk near a shed. Ducklings are in danger on a ledge. A beaver and a gull are busy near the water. Starlings raid a trash bin. A rabbit snacks in a garden. Geese gather near a pond. Foxes, owls, and bats fascinate the dog. This approach is both captivating and enlightening. As always, Morrison’s illustrations are lively, accurate, and fun to look at. With each illustration, more details are revealed about the natural world of the city. 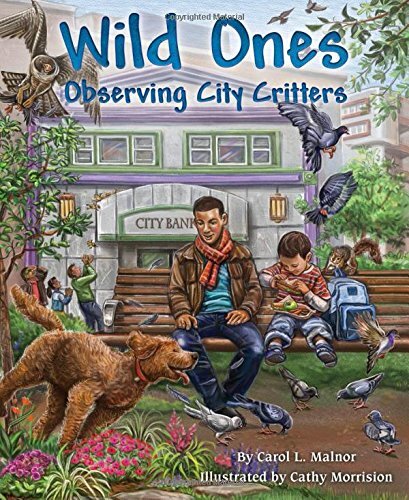 Second graders will learn a lot about the critters they pass every day. In addition to learning more about the creatures, many reading activities are suggested by the text, including looking for squirrels and their activities on every page. Kids can make observations and maps in their own backyard. Many facts and resources for further learning are listed after the story ends.